Most pure and natural Brazilian deep curl weave extensions, made of real virgin hair from Brazil. Cuticles from all bundles are intact facing the same direction, you will feel its sily and soft texture when running your fingers through the hair. The weave could still retain its curly pattern after being washed several times. Be sure to take good care of these extensions to keep its shine. We are the #1 wigs supplier online offering customers the highest quality real human virgin hair bundles. 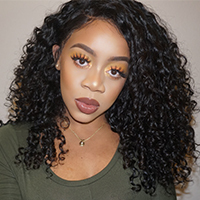 It is the 6A Brazilian virgin hair used in the weaves, the pattern of the hair would change a little after a long time usage, but it will soon back to its original tight curl state after getting wet. The deep curl hair can be straightened and colored, it accepts any processes and has few tangling and shedding. This is the best hair you will buy, only words Natural, Quality, Bouncy and Silky could describe it. always good hair Review by Ema J. Good quality hair always, really soft and nice communication with the seller. nice hair Review by Sara H.
I ordered the hair Friday and recieved it Monday. Communication is always amazing with this vendor. This is my 3rd order I will not purchase this hair for any other vendor. Love them for always be professional. hair is nice Review by Destiny T.